When a star pitcher goes down with an injury, a team must get someone else to pitch. That new guy is called a replacement pitcher. To see how good those understudies might be, I looked at cases of when this happened from 1946-2005. I examined the ERAs of the new guys (only in their starts, data from Retrosheet) and then determined what their winning percentage would be based on that ERA. That winning percentage will be an estimate of how good a replacement pitcher is. 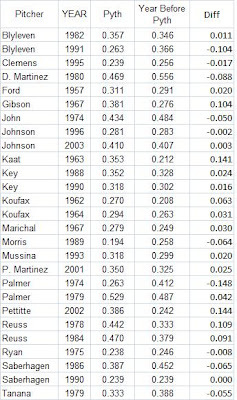 The cases come from any pitcher since WWII who was in the top 25 in career IP or in the top 25 in ERA relative to the league average (minimum of 2000 IP). Then I found seasons when they had a drop in IP of 25% or more from the previous season. This had to be followed by an increase back up of at least 25% (of the following year’s total). I did this to avoid cases of someone who had really declined or was near the end of his career. The idea is that their being out was somewhat temporary. If a pitcher had two seasons in a row of low IP, became a reliever, or was traded in the three-year period, I did not include it. I also only wanted to look at starters, so I did not check Hoyt Wilhelm, who ranked high in relative ERA. Also, IP totals were adjusted for strike seasons to be more in line with a normal full season. Jim Palmer, for example, pitched 140.333 fewer IP in 1979 than in 1978. 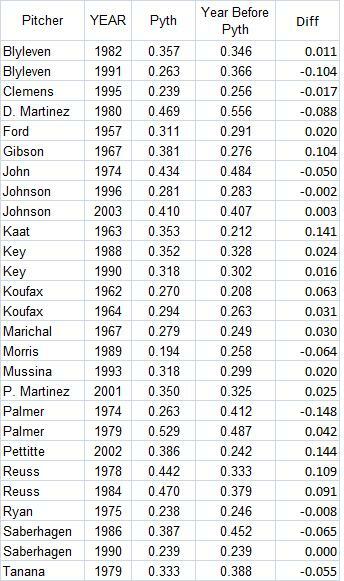 The ERA of the worst combined 140.333 IP on the Orioles that year was 3.99 (after adjusting for park effects). With the league ERA of 4.23, that would give a Pythagorean winning pct of .529. Since the Orioles got 140.333 fewer IP from Palmer that year than the previous year, they had to "replace" him. And we know he was not going way because he pitched over 200 IP the next year. Some of his IP literally had to be replaced. And the "worst" 140.333 IP on the Orioles that year were not really that bad. They had good replacements. But, as can be seen in the table, that was not always true. Jack Morris's replacements in 1989 combined to have a 7.94 ERA, good for a .194 pct. The overall winning pct of the replacements was for all 27 cases .348 (a weighted average based on the missing IP in each case). There are a host of issues associated with this study. I could have used the increase in IP after the year in question for what the replacements would have (or an average of the two). ERA may not be the best way to evaluate the replacements. Sometimes many pitchers were combined to make the replacement and some of them had very low IP totals. Maybe they only pitched on the road or at home, so the park adjustment might not be a good idea. Still another issue is that teams don’t pitch the same number of innings each year. If IP go up, regardless of who is or is not hurt, someone has to pitch them. So maybe in some cases I set the replacement IP too low. It might also be instructive to see how the worst pitchers on a given team did in the year before the guy in question got hurt. The next table shows the pythagorean pct for the year they were actually hurt and for the year before, covering the same number of IP (with adjustments for strike years being made). I also did not count the pitcher himself in determining the worst ERAs for starters on his team the year before he got hurt, no matter what his ERA was. 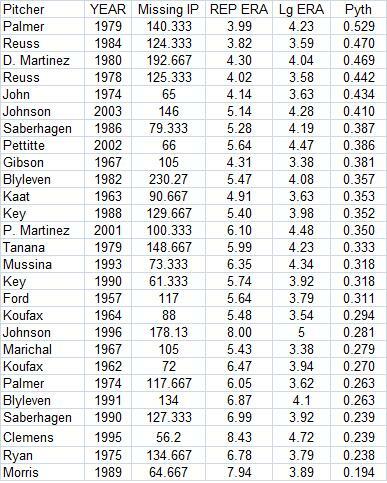 For Blyleven in 1981, for example, I looked at the worst 153.666 IP among starters (making an adjustment for the strike year). Once that was adjusted for park effects and the league average was used, their Pythagorean winning pct would have been .346. That is actually worse than in a comparable number of IP in the year when Blyeven was actually hut and had to be replaced. 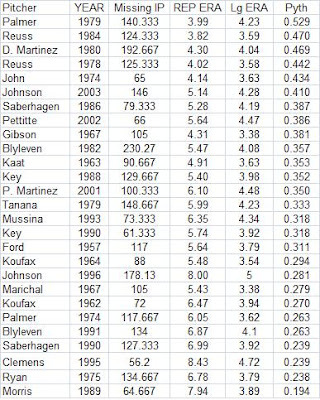 I would expect that the worst batch of starters' IP to have an even higher ERA the next year with Blyleven missing. But it did not work out that way. Only 9 of the 27 cases actually saw the projected winning pct of the worst starters go down. One example is 1991 for the Angels, when Blyleven missed the whole season and they had to replace the 134 IP they got from him in 1990. The worst 134 starting IP for the Angels in 1991 would get a Pythagorean pct. of .263. The worst 134 IP in 1990 has .366. That is the kind of thing we would expect when a good starter needs to be replaced. Yet this was not the norm. The overall composite or weighted average of the project percentages was .348 in the year these pitchers were hurt and it was .356 the year before. That seems like a very small difference. This tells us that when a star pitcher goes down, the missing IP are covered by a group of pitchers who perform about as well as the worst pitchers on that team the year before. It makes me wonder if every team is getting a fairly big chunk of its IP from replacement level pitchers each year. The one other thing to look at would be who actually took over the missing starts and see how they did. In 1967, Nelson Briles came out of the bullpen to make 14 starts in the second half of the season when Cardinal ace Bob Gibson got hurt. Briles went 10-2 with a 1.89 ERA as a starter. He then became a regular in the Cards rotation the next two years and was pretty much a starter (and a good one) for the next 10 years.